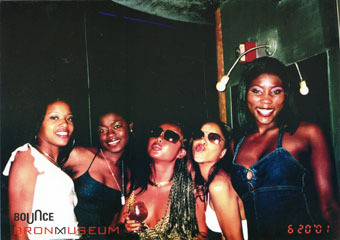 the LAB extends the Museum's exploration of contemporary cultural production into alternative and experimental art forms. 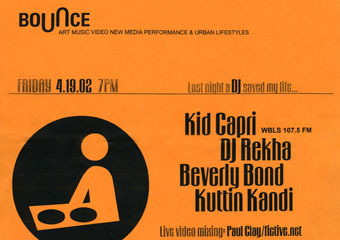 "Bounce" is presented in conjunction with the exhibition "One Planet Under a Groove: Hip Hip and Contemporary Art." 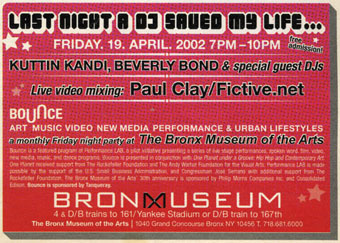 It brings DJ and club culture vibe into the Museum, blending urban lifestyles with an eclectic mix of music, live performance, video, and new media projects. 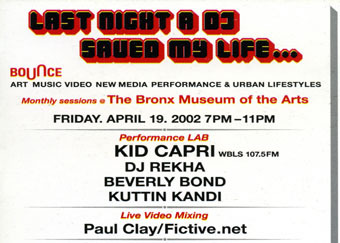 Fictive will be VJing with DJ's include Kid Capri, DJ Hollywood, DJ Grandwizzard Theodore, Doug E., DJ Rekha, Beverly Bond, Kuttin Kandi, and more.